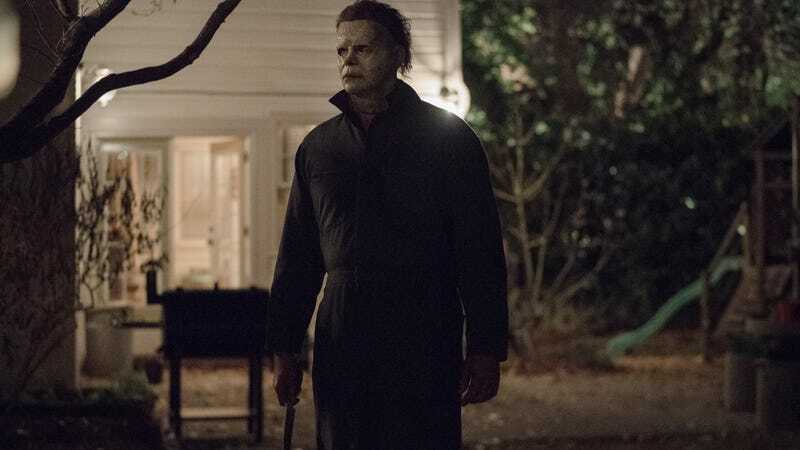 David Gordon Green’s Halloween reboot—which ignores the sequels and brings back original star Jamie Lee Curtis—won’t be silently stalking its way into theaters until next month, but it’s never too early to start preparing for the arrival of Michael Myers. Some Halloween fans might just want to make sure they have a wire hangers on hand to stab any potential intruders in the eye, but we’re just happy to kick it to John Carpenter’s iconic Halloween theme. Today, John Carpenter, Cody Carpenter, and Daniel Davies have released the reboot movie’s new version of the Halloween them, dubbed “The Shape Returns,” and it’s pretty damn rad. It’s a pretty traditional version at the start, but it kicks in with a synth-heavy riff halfway through that is extremely John Carpenter in a very good way. It’s more straightforward than the deconstructionist take of Atticus Ross and Trent Reznor’s nearly eight-minute cover from last October, but that’s probably for the best. Reznor and Ross made you really work for the recognizable Halloween melody, while Carpenter would rather just barge in with his synthesizer like Dr. Sam Loomis warning everybody that Michael Myers is coming back.